The Churchill Hospital site contains a number of buildings. The main ones are listed below. Please check carefully where you need to go so that you can choose the closest car park or bus stop. Oxford University Hospitals is a base for leading experts in the diagnosis and treatment of cancer and assocated conditions. The majority of our services have been brought together on the Churchill site in the Oxford Cancer and Haematology Centre. Diabetes services at Oxford University Hospitals are provided from the Oxford Centre for Diabetes, Endocrinology and Metabolism (OCDEM), which is based at the Churchill Hospital. Sir Michael Sobell House, Oxford, is an adult specialist palliative care service for people with a life-threatening illness. The multi-professional team is supported by volunteers. The work of Sir Michael Sobell House is supported by Sobell Hospice Charity. The new patient wing was opened in 2003 following a major fundraising effort by the charity. 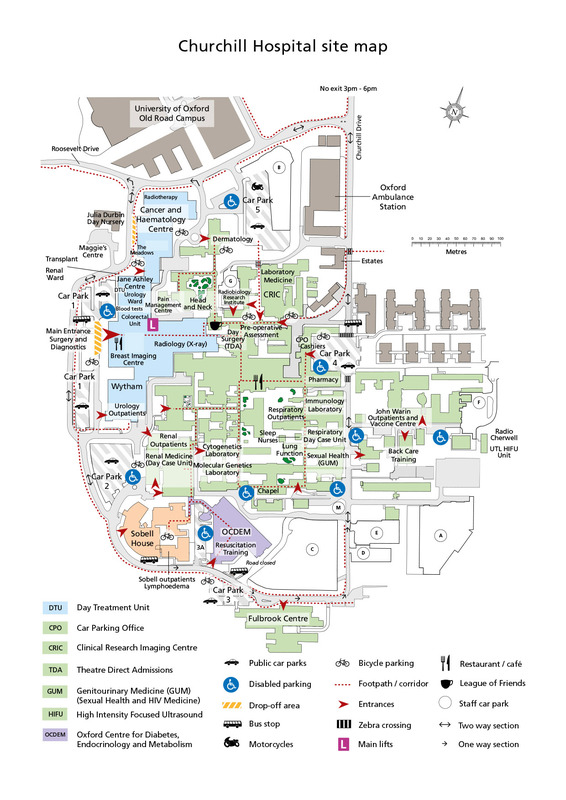 The Fulbrook Centre, next to Car Park 3 at the bottom of the Churchill Hospital map, incorporates the Cherwell Ward and is run by Oxford Health NHS Foundation Trust.